Last weekend I was invited to Tia Maria's 'Dark Room' event in Manchester city centre for an evening of cocktails, beauty and music. The event was curated by Radio One's very cool Gemma Cairney who DJ'd later in the evening and was there all night chatting to guests- she seemed really lovely. On offer were a selection of Tia Maria cocktails. Being a massive fan of White Russians, my first choice was naturally the Tia Maria Skinny White Russain. I tried the other two cocktails as well; a Tia Maria Espresso and another which was mixed with Jamaican ginger beer which I think I actually liked best! I came straight from work and it was completely by accident that I wore this new shirt by Monki which matched the Tia Maria colours perfectly! I was really pleased to hear that WAH Nails were going to be at the event doing nail art as I've had the pleasure of having my nails done by the WAH team before and they really are amazing at what they do. 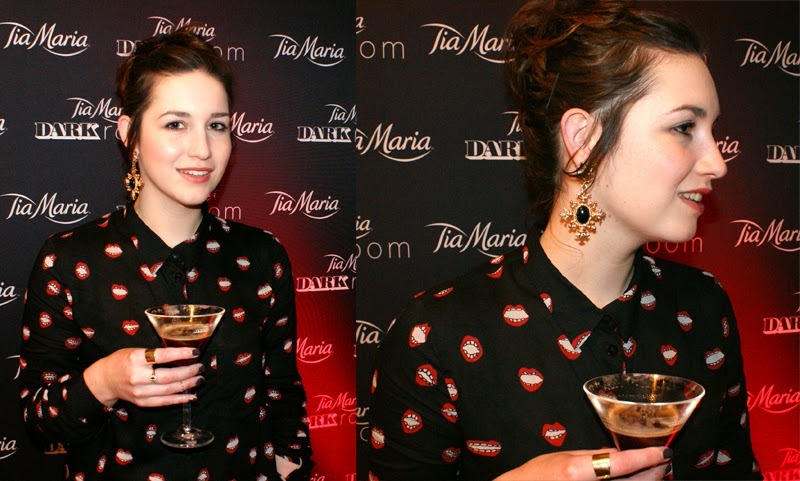 The team had come up with five designs exclusive to the event based on a Tia Maria colour palette. I chose a mottled overlay accent design with a gold tip and chose the purple slate coloured base for the rest of my nails. They looked so good and lastest for ages. Toni & Guy were also present doing some amazing hairstyles for guests though as you can see, my hair was due a good wash and piled up on top of my head so I didn't get involved in that. The baroque-style earrings and plain gold midi and band rings are from a Manchester-based boutique called Style B4 Fashion who have a shop in Afflecks Palace. For anyone outside of Manchester you can buy online too. Are you a fan of Tia Maria? Obsessed with your shirt. Looks like a great event!